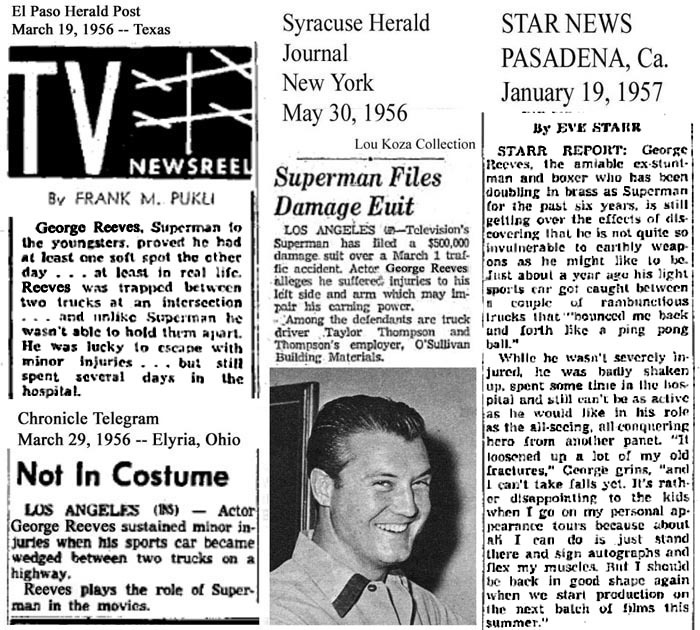 In the many years the modern media has been telling the circumstances surrounding the death of George Reeves, it has told that a series of automobile accidents were related in a plot to murder George Reeves. The following is a gloss over of these incidents. 1 - George's car was pinned between two trucks on the highway. 2 - A lumber truck rear-ended George's car. 3 - The brakes were drained from George's Jaguar causing him to careen into the side of an embankment. 4 - George had to quickly dodge a car(s) that came close to hitting him. I've reached back into my archival files to pull out some books that have told these stories. During the respected periods of when these books were released most events in George's life and death were told in all sorts of varied fashions adding to the mythical proportions this case has taken. Below you will find I lifted excerpts from four books. It is safe to say these books do not hold any form of accuracy, and perhaps it's due to the writers having little to go on and much imagination to offer in the name of cranking-out paragraphs. As you read these excerpts, you might ask yourself; how is it the writer can extend information further than the news articles? Especially when there isn't much information given. Therefore, who is elaborating on these stories? There are many tales spun to support the many theories of George's death. There exist stories that the car accidents he was involved in were all related and a plot to support that someone wanted George dead. The person mostly suspected of wanting to see the last of George Reeves was Mr. Eddie Mannix. The motive; because from late 1958 to June 1959 George was upsetting the "sophisticated arrangement" Mr. and Mrs. Mannix had with each other. The purpose of this writing is to 1) bring you, the reader, up to date because not everything you read is 100% accurate and 2) bring certain elements of the case into perspective. Of course, many times in the web pages of The Adventures Continue have we brought down decades old tales long thought to be the truth. The best example is proving Frank Bessolo did not committed suicide. I think the key in having doubts in any detail of the case for me is when it is told in varied forms. It should be noted that even news sources of the time, the information is told in varied form. But the one key element that can't be disputed is the common denominator of dates these occurrences happened on. It is here you will see how the tales have been spun with very little accuracy and ultimately are blown out of proportion. Keep in mind, the book excerpts will tell the tale that these accidents happened during the Lenore Lemmon months. To give you an example of the liberties taken, it has never been confirmed exactly when Lenore traveled by airliner to California to be with George. One account is she traveled with George on his return to Los Angeles from New York in early to mid-October 1958. Another account is she traveled alone by airliner on January 1st, 1959. Then another is she traveled on Valentines Day. A guest on the Long Beach James Craig television segment "Talk of the Town" from the early 90's tells that one day she just showed up, knocked on the door of 1579 and surprised George. As if to say, she was a bit on a gold digging journey. Again, varied stories are told. Therefore, how can a writer or person being interviewed spin a yarn without the real details? All they know is Lenore went to California, and everything else is filled in to appear having a higher knowledge of the subject. According to Lenore in her 1989 interview, George called her many times to come out to California. I'll leave you now to read the excepts from these books, followed by the contemporary news articles of the times. Hollywood's Unsolved Mysteries (1991), Pages 255 - 257: In the months just before his death, Reeves suffered three mysterious auto mishaps that nearly killed him. The first time, Reeves' car was nearly crushed between two trucks on the freeway. Another time, a speeding car nearly killed him, but he survived thanks to his quick athletic reflexes. The third time, his brakes failed on a narrow road, because all the brake fluid was gone from the hydraulic system. A mechanic later found the system to be in perfect working order. "When the mechanic suggested that someone had pumped out the fluid, George dismissed the notion, " said (Art) Weissman. Weissman was then, and is now, convinced that those three automobile accidents were not accidents. Someone wanted George dead -- and that someone could only have been Eddie Mannix. 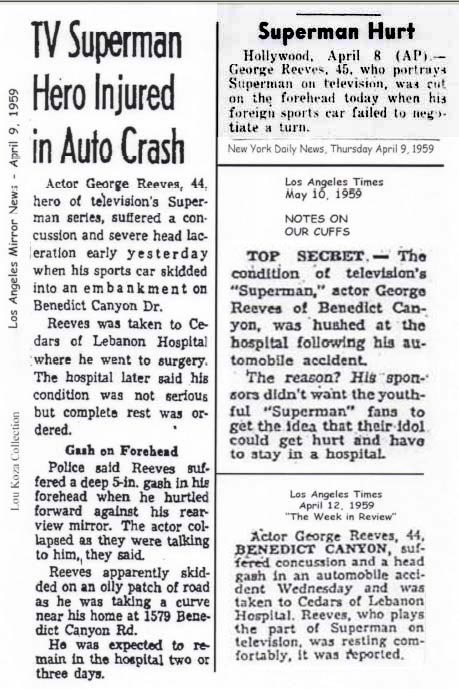 Hollywood Kryptonite (October 1996), Pages 98, 99 & 101: On the morning of April 9, 1959, George was driving his three-year old Jaguar, when suddenly he lost control of the car and hit a cement abutment on Benedict Canyon near Easton Drive, just a few minutes from his house. George smacked his head on the windshield, suffering a mild concussion and opening up a nasty gash on his forehead. He was able to extricate himself from the car on his own, but several police arrived at the scene, George suddenly collapsed. He was taken to Cedars of Lebonon Hospital, where his doctor kept him overnight for observation. They finally sent him home with twenty-seven stitches in his head and a pocketful of painkillers for the headaches that began as soon as he left the hospital. While George was in the hospital, a mechanic checking his car made a shocking discovery. He would later tell the police officers -- the ones who had shown up at the scene of the accident--that it was "a miracle George hadn't been killed and taken a few other people with him. Didn't George know that there wasn't enough brake fluid in the Jag to fill a cavity?" The discovery that the Jaguar's brakes had drained away made George wonder about the previous accidents he'd had in Sherman Oak's in the custom-made Alvis. At the time he hadn't given it much thought. He had been so proud of the car, ever since he and Toni drove it out of Cavaliers Motors right into Beverly Hills traffic, big smiles on their faces. A lumber truck had tailgated him one afternoon when he was driving alone down Ventura Boulevard and finally plowed right into the car's back fender. George had sued the lumber company, though he'd felt badly for the driver of the truck. Now he wondered if the two accidents were related, or was he just becoming paraniod? Is this what Toni wanted all along, that he would lose Leonore and his sanity at the same time? TAC Editor's note: The accident in April 1959 took place on the 8th and was reported on the 9th. 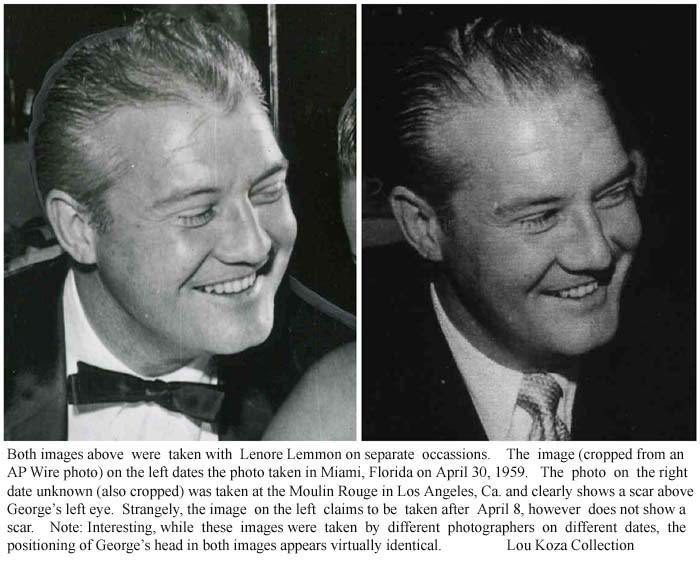 The Hollywood Book of Dead (2002), Page 280: ...George had also been involved in several recent traffic mishaps, which in retrospect could have been potential murder attempts. The Fixers (2005), Page 255, 256: In addition to his relationship issues with Toni and growing disenchantment with Lemmon, a string of odd "accidents" began haunting Reeves. In late 1958, on the Hollywood Freeway, Reeves' Alvis -- the long ago gift from Toni -- was sandwiched between two large trucks. Reeves slammed the brakes and slide to the side of the road as the trucks drove off into the night. Reeves brushed off the incident, but just a few weeks later, as he drove down a steep canyon road, from Mulholland towards his house another large truck tried to run his car off the road. He was barely able to avoid hurtling off the street down into the deep ravine below. Again, the truck disappeared. Just before Christmas 1958, a black sedan appeared out of the shadows on Benedict Canyon and tried to hit Reeves as he stood in front of his house. The car careened down toward Beverley Hills after just missing the shaken Reeves, who had to dive onto his front lawn to escape it. The incidents were eerily similar to the "accident" that befell Bernice Mannix's a decade earlier. TAC Editor's Note: Bernice Mannix died on November 20, 1937 as a result of the car she was a passenger in overturned on a road 4 miles South of Palm Springs. The driver, Al Wertheimer failed to see a tow-car and stalled automobile on the highway in time to avoid them safely. Bernice was pinned beneath the overturned car. Mr. Wertheimer was thrown twenty feet from the wreck and suffered crushed ribs, broken shoulder and severe internal injuries. He was hospitalized but survived the near death incident. Eddie Mannix at home in Beverly Hills at the time, rushed by air to the town of Banning taking charge of his wife's body. He proceeded to take her to her hometown in Massachusetts for burial. This information was detailed in the Los Angeles Times the day after the accident. You the reader ask yourself; does this accident sound like it could have been orchestrated? It doesn't to me. If there was any doubt that someone wanted Reeves dead, it disappeared in the early morning of April 9, 1959, when Reeves' Jaguar piled into the cement light pole at Benedict Canyon and Easton Drive, a half-mile north of his home. As he sped down Benedict Canyon -- Reeves was notorious for driving too fast -- he realized his brakes were not working. Trying vainly to slow the car down as he hurtled down the winding hill, he lost control and the car slammed into the pole. Reeves was thrown almost all the way through the windshield, suffering a severe concussion and a five-in gash on his forehead that required almost 30 stitches. He could have easily have died in the wreck. When a mechanic inspected the demolished Jaquar he found that all of its brake fluid had been drained. As an associate mentioned at the time, It looked like someone wanted George dead." TAC Editor's Note: Once again, the date of the accident is incorrect. At this point, I have newspapers articles for you to make a comparison with what is told in the above book excerpts. March 19: Reeves was trapped between two trucks at an intersection. March 29: ..his (Reeves) sports car became wedged between two trucks on the highway. May 30: ...filed a $500.000.00 damage suit over a March 1, traffic accident, and mentioning the O'Sullivan Building Materials. January 19, 1957: Just about a year ago his (Reeves) light sports car got caught between a couple of rambunctious trucks that "bounced me back and forth like a ping pong ball." It would seem the last quote from George would suggest the vehicles were in motion. It seems to me the March and May articles are referring to one accident that took place on March 1. It seems highly implausible that these articles are referring to more than one accident. The tale of a lumber truck rear-ending George's car is the one told with the lawsuit with the O'Sullivan Building Material company. What makes sense to this writer is the modern day tales of two accidents involving a total of three trucks is actually one accident involving two trucks, one owned by the O'Sullivan Building Materials. As told in the above excerpt the trucks drove off into the night. That doesn't seem to be the case since the O'Sullivan Building Materials is named. OK, now that we've established that the two incidents is actually one, the time has come to address the period of time. The books listed above have left readers believing all these events happened after George left Toni Mannix some time between August 1958 to Mid-October 1958. October, depending if you believe he broke off the relationship with Toni when he returned from New York and after meeting Lenore. I'm of the belief he broke off the relationship prior to traveling to New York, where he met Lenore. It is obvious from the 1956 dates; the truck incident had nothing to do with a 1959 alleged murder attempt on George's life. The reason is, George and Toni where together during this time. How writers over the years have placed this accident in late '58 to 1959 is a mystery. I think it is safe to say that the accidents were not related. The idea this supports a murder plot simply holds no substance. I also think it is safe to say the incidents involving George dodging out of the way of shadowed vehicles are nothing short of tall tales and imaginations. In all the news articles I've come across, I've found no coverage of this. Maybe it simply didn't make the news and is more of a hearsay matter. It should be noted, while Benedict Canyon Drive has been widened since 1959, thereby shortening the front yard of 1579 during George's years living there didn't make much difference. If George had been standing near curbside, it wouldn't be normal to not be alert there. If a person is not paying attention, an accident could easily happen. I suspect in the end, it's more of author liberties being taken to elaborate their theories with little knowledge of the events as they relate to the calendar. Finally, there is the incident that took place on April 8, 1959. Please read the next series of news articles. What are we to believe? Oil slick? Brake fluid drained from system? The tale of the brakes being drained, and then replaced is a bit much to accept at face value. Other inconsistencies told in the book excerpts is George hitting an embankment, or is it a cement pole? Did he walk all the way home, or did he faint at the scene of the wreck? With the police on the scene, it would be logical to believe the newspapers were informed correctly that the car skidded due to oil on the road and hit an embankment. Thanks to the technology provided by 2012 Google.com- maps, on the left is an aerial view of 1579 Benedict Canyon Drive, looking north to Easton Drive. You can see from the image that a walk from Easton to 1579 is no short distance. A relaible source stated to this writer that a news article does exist stating George walked home. Before George could enter the house the police pulled up to his driveway. If George walked this distance, while bleeding from a gash on his forehead, it would be no wonder he lost consciousness when he arrived at his doorsteps. It's to his credit he made it that far. A Star-News article titled "Superman Out Cold in Auto Crash," dated April 8, 1959, states the accident occured at 12:45am, the neighbors assisted George with his injury and they called the police. It also names Officers R.L. Sauter and J.R. Ide arriving on the scene. George told police he failed to negotiate a curve near Easton Drive when his automobile went into a broadside skid and hit an embankment. While questioning him he passed out. I'd asked earlier who could be elaborating on these stories. In Hollywood Kryptonite, the authors quote Art Weissman as a source. Since Mr. Weissman knew George in those years, it seems he would know first hand there was no relation between the incidents. Strange. I think you will agree that there are many elements entwined within the case of George's mysterious death. The "Accidents" as told in the book excerpts is one example of many that proves there has been a lot of misinformation being told to build a case for one theory or another. You will note above, Lenore corrects the Interviewer that there was only one accident in 1959, not two. Regarding an ebutment, an embankment, or a side of mountain near Easton Drive. From the images, I see no evidence of any of these. But times have changed since 1959 with the addition of many homes along the canyon road. March 1, 2012, marks 56 years ago when the accident with the trucks happened. As the saying goes, accidents will happen. It seems once again, in the life of George Reeves there is much ado about nothing. Drive safe my friends. 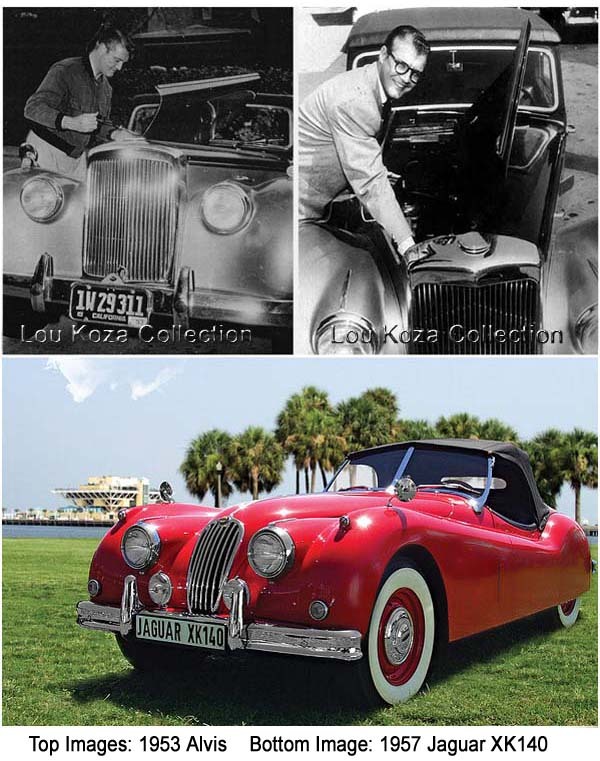 The items contained in the feature pages titled The Curious Case of the George Reeves Car Accidents by Lou Koza is the copyright and ownership of Lou Koza and cannot be reproduced by any means, in whole or in part without Mr. Koza's written permission.